In the earliest days of a season filled with intrigue and expectations, the Mets have been tested early and often. Their roster has been stretched to the limit. Their selflessness has been subjected to scrutiny. In beating the Braves, 7-1, Tuesday night, the Mets won their ninth straight. It is their longest winning streak in seven years. "It was just a great all-around night," said highly-touted catching prospect Kevin Plawecki, who went 2-for-4 with two runs scored in his big- league debut. At 11-3, the Mets are tied for the best mark in all of baseball. For the first time, the Mets played a full game without starting catcher Travis d'Arnaud and lockdown lefty specialist Jerry Blevins. Both suffered broken bones on Sunday. 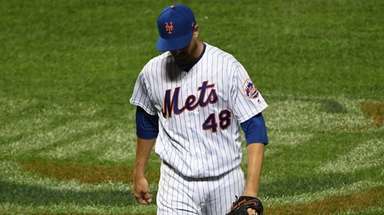 But on a night when both would have been key, the Mets leaned upon their replacements. Plawecki, 24, showed the composure of a veteran thanks to some coaching by d'Arnaud. His single in the fifth helped power a four-run inning that was made possible when Braves second baseman Phil Gosselin booted a sure double-play ball. Later, in a spot that would have been tailor-made for Blevins, lefthander Alex Torres came through to squash a rally. 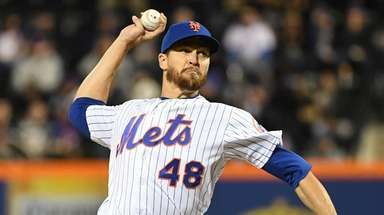 To end the seventh, Torres struck out notorious Mets tormentor Freddie Freeman. 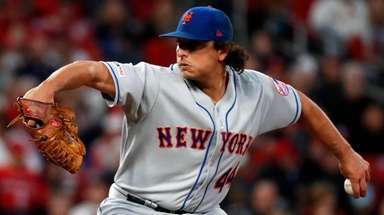 "He's going to be a big piece," said manager Terry Collins, who has been able to piece together a relief corps that has been ravaged by injuries. 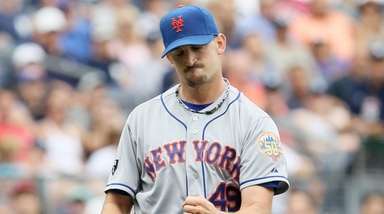 Starter Jonathon Niese (2-0) allowed four hits and walked five in 62/3 innings, but limited the damage to one run. He got plenty of support from Curtis Granderson, who went 3-for-5 and knocked in four runs, all after beginning the night with a .146 average and no RBIs. Before a Citi Field crowd of 21,033, including Plawecki's parents, fiancee and an army of friends, the Mets continued their longest winning streak since taking 10 in a row from July 5-17 in 2008. "The clubhouse, it's got a different atmosphere in there," Collins said. "The other day obviously we lost two big pieces. But the first word out of the majority of the guys' mouths is that we're still OK."
But the Mets did one better by backing their words with actions. Consider d'Arnaud, who on Monday night invited Plawecki to dinner. At a restaurant in Long Island City, d'Arnaud offered a crash course in handling the pitching staff. In the dugout, it was d'Arnaud who celebrated Plawecki's hits as if they were his own. It was d'Arnaud who counseled him about the relievers he would soon catch. It was d'Arnaud who greeted Plawecki when his first big-league at-bat ended in a lineout. "After that, I was really excited and just got back to playing baseball," Plawecki said. There is one starting catcher's spot, and if all goes according to plan, the Mets could have two capable players. It's a reality that can breed awkwardness. Yet, when presented with the scenario, d'Arnaud offered a blank stare. He was perplexed. He hadn't even considered it. "That thought honestly hasn't even come into my head," he said. "Like I said, it's about playing for the name on the front, playing for the city. 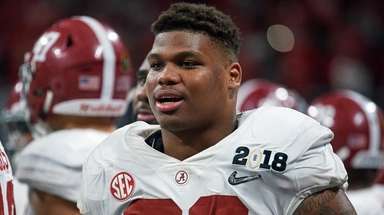 That's what we're all here for, to win a championship." The Mets have followed through. Through the first 14 games, they have equaled the best start in franchise history, joining the fabled 1986 team.